Around this time of year, we get a lot of people coming in saying that there’s no colour in their garden at the moment. It can seem difficult, especially if you do all or most of your planting in the Spring. There are a lot of great plants out there that just aren’t available in the Spring. Many late bloomers are also late to come out of the ground so they aren’t available in May, and this includes one of my favourite plants, the perennial Hibiscus. Yes, I said Hibiscus. I’m not talking about the rose of sharon, although I do like them as well. 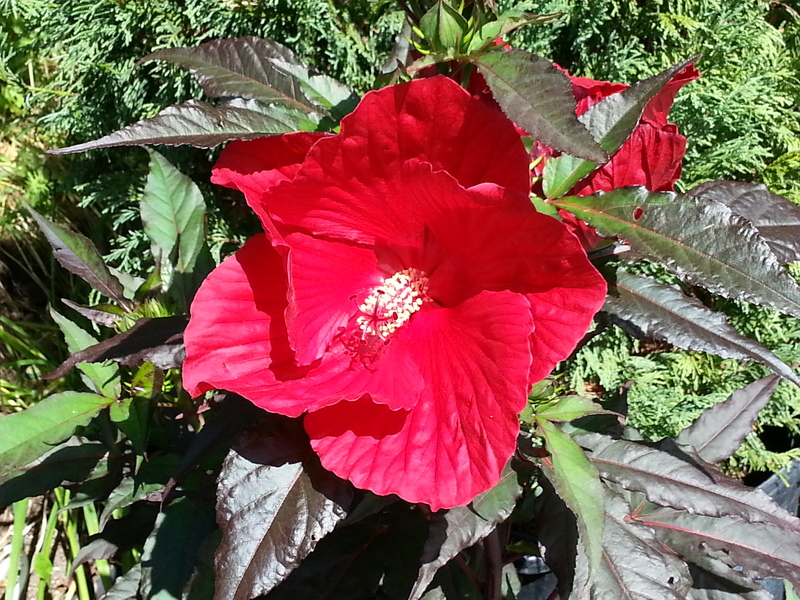 Perennial Hibiscus are bold, show-stopping plants with absolutely huge flowers as big as 10 inches across. My friend Nancy has one planted at the side of the road and says that cars actually stop in front of her place when the Hibiscus is blooming. I know what you’re thinking. They must be difficult to grow or you have to protect them for the winter. Absolutely not. Once established, they almost never need water which made them a godsend this year. As well as being drought tolerant, there are a number of varieties that are wet tolerant. I have one planted in my bog. They’re very salt tolerant which means you can plant them by a walkway or at the side of the road and they’re also very hardy at Zone 4. All they need is a sunny location, but you want to make sure you get the right spot – they don’t like to be moved. Before I started the garden centre, I had rather extensive gardens that required regular weeding and dividing. Friends used to wonder how I managed to keep them and work a regular job. The garden centre of course took over my life and my gardens are a disaster. Most of the plants have been choked out by weeds and grass and they never get watered. What has survived are the really tough plants and even I was surprised to see that the hibiscus were thriving, rather than just surviving. The flowers only last a day, but once a plant has been in for a few years, you get multiple flowers each day and they usually continue from late August until the first hard frost. They come in pure white, white with a red centre, white and pink swirls, soft pink, bright screaming fuschia pink, and red. They also can have green or purple leaves that are either shaped like a spade (the card suit, not the shovel) or deeply divided like a Japanese maple. The height varies as well, with most being between four and six feet tall. It’s hard for me to pick a favourite variety since I love them all. I will say that Blue River II (the pure white one) absolutely glows in the evening. Sitting on my deck at night, you can’t help but notice it even from 100 feet away. Midnight Marvel is a new variety with dark purple foliage and a blood-red flower. It is absolutely stunning. This entry was posted in Columns and tagged Blue River, Hibiscus, Hibiscus moscheutos, late bloomer, Midnight Marvel, Rose Mallow. Bookmark the permalink.